Apartment unit in a triplex waterfront home. 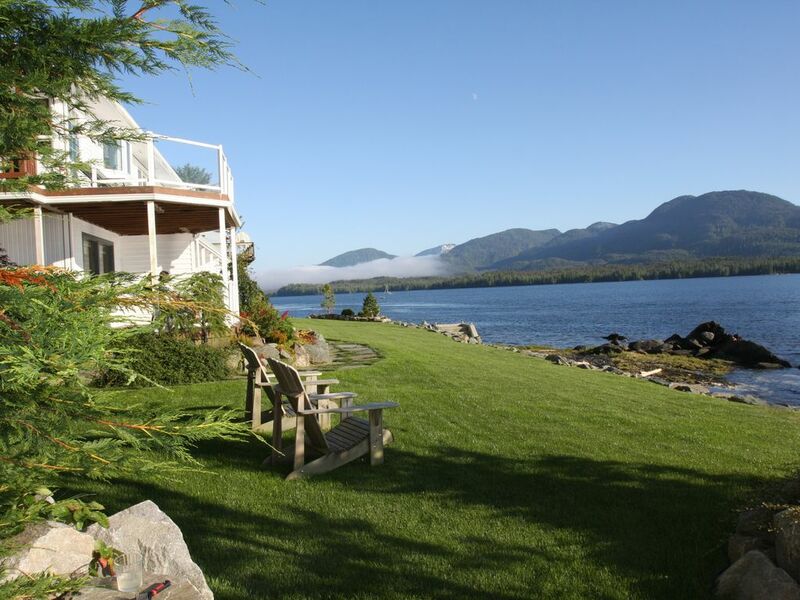 Anchor Inn by the Sea is located only four miles from downtown Ketchikan in one of the best shoreline fishing and whale watching areas that Ketchikan has to offer. The Inn has three private suites (1 & 2 bedroom) all suites have private entries, private decks and beautiful ocean views. Although the suites are all private, the yard is shared space. The grassy yard is a favorite with our guests. It is a beautifully landscaped yard with lush green grass, overlooking the ocean. The guest suites are as close as you can get to the ocean. Bring your camera because otter, seals, and porpoises are frequently seen. Eagles nest close by and are often seen perched on a pole near the water or pulling a salmon from the ocean. Humpback Whales and Orcas are the most exciting for our guests to see. We can guarantee that you will see some type of wildlife every day of your stay. The suites are outfitted with everything you need to feel right at home; equipped kitchens, dining area, living room and a full bath. The suites have queen beds, wireless Internet, SmartTV, and either a full kitchen or a kitchenette. This ad, the rates and the calendar are for the one bedroom suite. At the Anchor Inn by the Sea the ocean actually goes under the house on a high tide. Anchor Inn by the Sea has a rocky beach to explore tide pools, starfish and look for sea glass and driftwood. Anchor Inn by the Sea is on the oceanfront as close as you can get. On a high tide the water comes up to the rock wall bordering the property. Anchor Inn by the Sea is a waterfront home. Smoking is allowed on the outside covered decks. 3 separate units - 2 one-bedroom units and 1 two-bedroom unit, king or queen size beds, fully equipped kitchens, washer/dryer, private covered decks and gas barbeques. I spent 6 days and 5 nights in the Admiral Suite and I could not have been happier! Beautiful scenery, amazingly decorated and spacious rooms, private bathrooms, big walk-in showers, immaculate kitchen with any pots/pans your cooking heart needs, I cannot express enough how happy I was staying here and I highly recommend everyone else to stay here as well, the whole world needs to experience this amazing Alaskan adventure!! Craig, thank you for the nice comments. We hope you will be able to come back and stay with us again. We really enjoyed getting to know you! The most beautiful and relaxing place to stay I've had during my holiday. A unique, carefully furnished and fully equipped studio with a wonderful terrace and unique view on the water. It was great to have a visitor from the Netherlands! THANK YOU!! My wife, daughter and I have stayed at Anchor Inn multiple times. I must say this is the nicest "condo" on the water. We've seen Whales, Sea Lions, Sea Otters and a host of other animals right from our balcony. Worth every penny and more. Truly one of the most relaxing vacations I take during the year. Thank you Greg and Mary. Stay here, you won't be sorry! The views from the rooms at the Anchor Inn by the Sea are amazing! Mary and Greg are amazing hosts. We stayed in the Aleksandra Suite, it was so nice. Very comfortable, tasteful decor. No oven, but a cooktop, microwave and grill on the porch. It was so nice to just sit and look at the beauty. The view from the room is fantastic. It is just a short 10 minute or less drive from town. I can't recommend it highly enough... We will stay there again and again! We have been visiting Ketchikan once or twice a year for nine years. Anchor Inn by the Sea is our favorite place to stay. The views are spectacular, the grounds are beautiful, the accommodations comfortable and well stocked, pride of ownership is evident in each well appointed apartment, and the owners, Mary and Greg give us just the right amount of attention to make each stay enjoyable and memorable. Views from the kitchen table and the porch include fishing boats of all sizes and types, passenger ferries, cruise ships, cargo barges, local skiffs, and kayakers. Float planes fly to and from fishing camps and other destinations. Marine life includes humpback whales, orcas, porpoises and salmon. We have seen eagles fishing and watched ravens, mink and other wildlife. Sunsets are stunning. Deep Sea Fishing for Halibut or Salmon, Ketchikan is the 'Salmon Capital of the World' We would love to book your charter fishing for you on one of the best boats in the area, Let us know if you would like to go FISHING, we will help set you up with a skipper for a day or two of either Salmon or Halibut fishing.